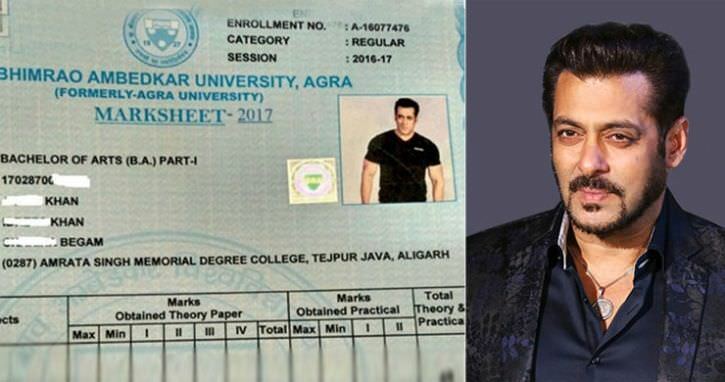 A mark sheet issued by the Agra university for a first-year BA student had the photo of Bollywood star Salman Khan on it. University officials found out about it while cross-checking the results before giving them out to students. They blamed it on the private agency which was tasked to prepare the mark sheets. The report card was recalled and rectified by the university after the blunder came to light. It belongs to a student of Amrata Singh Memorial Degree College in Aligarh, which is affiliated to Agra University. The mark sheet, a copy of which has been obtained by TOI, has a passport-size photo of Khan with the name of the student, who scored just 35%. The discrepancy is not the only one. Sources from the university administration said another mark sheet had the photo of Congress vice-president Rahul Gandhi on it. "There are scores of mark sheets where Bhimrao Ambedkar's name is printed in place of the name of the student. Such mistakes are usually committed by the private agencies to whom the job of printing the mark sheets is outsourced," said a source. The public relations officer of the university, G S Sharma, denied the mistake happened. "We haven't received any complaint in this regard," he said. A total of 7.2 lakh students belonging to more than a thousand colleges affiliated to Agra University appeared for examination for the 2016-17 session. Earlier last year, an inter college in Agra pasted a photo of Arjun Tendulkar, son of cricketer Sachin Tendulkar, on an admit card issued by the state board for the high school examination. President Ram Nath Kovind is slated to give away medals and certificate to students at the Agra university during its convocation in December. Somebody is trying to be funny at the cost of someone else's future.